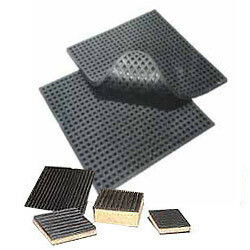 The range of anti vibration pads we offer are made from pure cork or cork rubber composites. It has excellent resistance to aging, water, oil and compression set. We offer these anti vibration pads in various sizes and thicknesses as per customer requirements. Its unique cellular structure of corks is filled up with tiny air pockets that absorb the vibration caused by the equipment. Backed by more than two decades of rich industry experience, well developed production expertise as well as services of experienced industry professionals, we are successfully meeting the demands of hardwares, finding application in the central air conditioning and refrigeration industry. These include threaded rods, anti-vibration rubber pads, ribbed rubber sheets, workers' hand gloves, industrial shoes and others. In addition to this, we also offer various household and kitchen electrical appliances, electrical household appliances, home kitchen appliances, small household appliances, electric kitchen appliances etc, like voltage stabilizers, sandwich makers, electric tandoors, room heaters, ceiling fans, table fans, water geyser etc.